On Friday, April 12th, 2013, we achieved a significant milestone by releasing a new version of our software. I was able to leave work a little early. Instead of taking the bus home, a co-worker dropped me off at Harbor and MacArthur. Jeri, Elizabeth, and Josiah picked me up in the Carl’s Jr.’s parking lot and we headed to Disneyland (actually California Adventure). We arrived at the park a little after 4:00 PM. 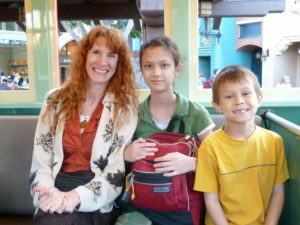 Jeri, Elizabeth, and Josiah on the Red Car Trolley. Click photo for full size. 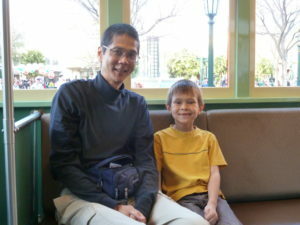 Tim and Josiah on the Red Car Trolley. Click photo for full size. Because it was a little busy, we first got FASTPASSes for Soarin’ Over California. Then we saw two shows, “It’s Tough to be a Bug” in 4-D and “Aladdin” (featuring live actors). After Aladdin, it was time to use our FASTPASSes. We headed over to Condor Flats (home of Soarin’ Over California). 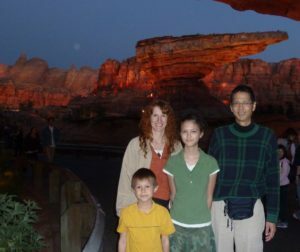 Because Josiah was feeling a little nauseated, Jeri sat on a bench with him while Tim and Lizzie went on the attraction. For those not familiar with the ride, here’s my description. After buckling into your seat, the ride lifts you up and gives you the sense of motion…soaring, dipping, accelerating, etc. In addition, the sights, sounds, and even smells give you the sensation of literally flying over California. 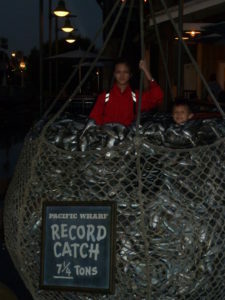 You are taken on a tour of many scenic locations like the Golden Gate Bridge, Yosemite, San Diego, etc. 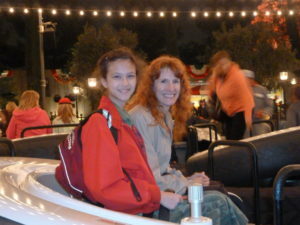 Then we walked back to the park entrance and took the Trolley to the Hollywood Tower Hotel. 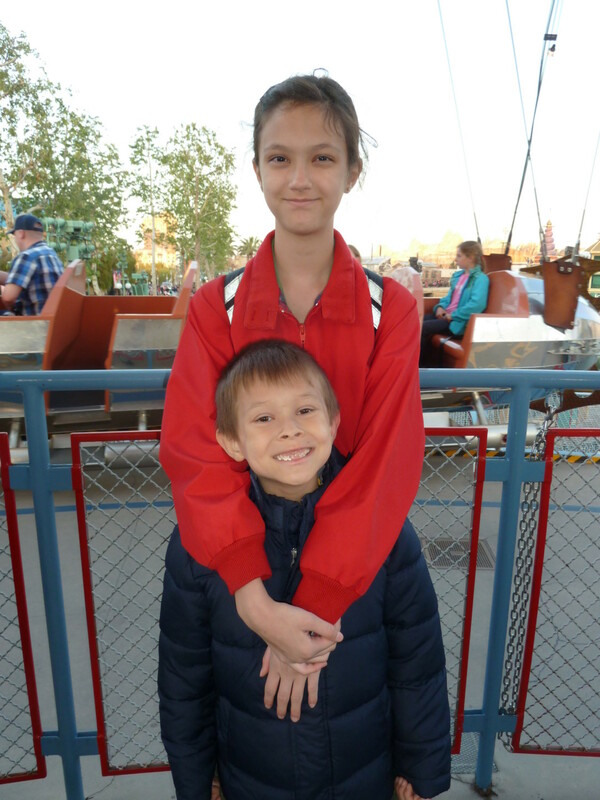 From there we walked to Luigi’s Flying Tires and went “flying.” Then we spent some time on Paradise Pier…Goofy’s Sky School, Silly Symphony Swings, and The Bakery Tour (where they give our free sourdough bread samples). 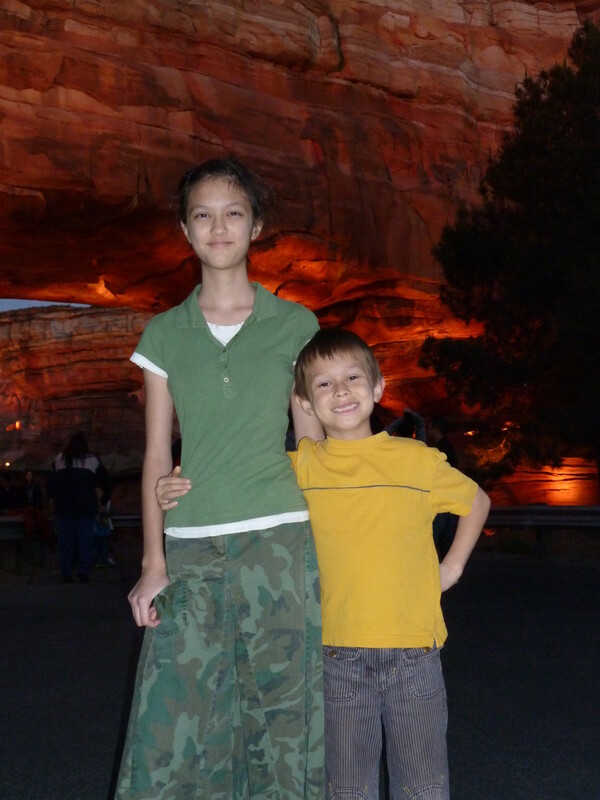 Elizabeth and Josiah next to the Golden Zephyr. Click photo for full size. 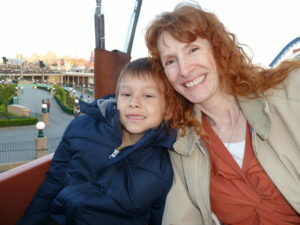 Josiah and Jeri on the Golden Zephyr. Click photo for full size. 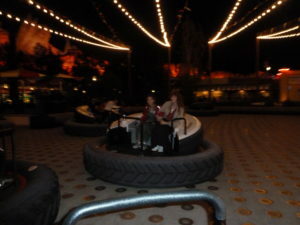 We made sure that we were in Cars Land to watch the lights come on (at 7:25 PM). We stopped for photos in Monument Valley. Elizabeth and Josiah in Radiator Springs. Click photo for full size. Josiah, Jeri, Elizabeth, and Tim in Radiator Springs. Click photo for full size. Elizabeth and Josiah part of a record catch. Click photo for full size. 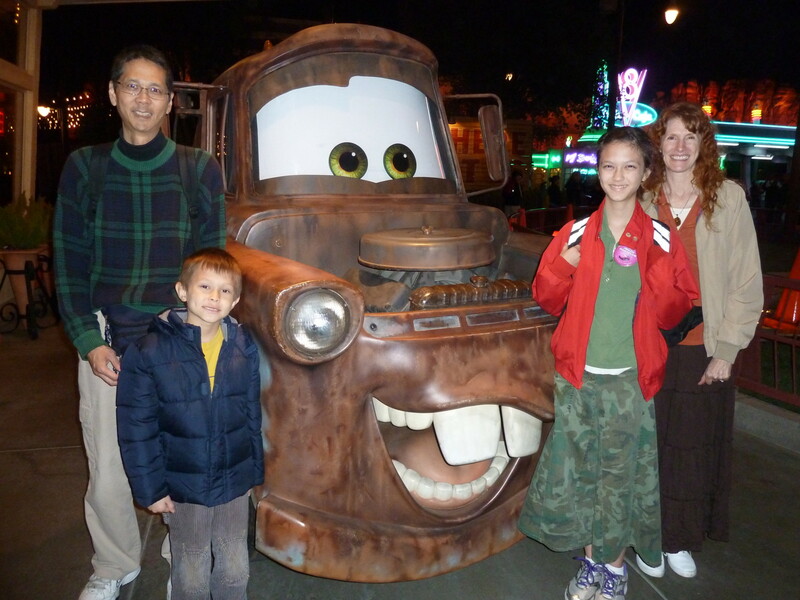 Tim, Josiah, Elizabeth, and Jeri with Mater. Click photo for full size. Elizabeth waiting for Luigi’s Flying Tires. Click photo for full size. Elizabeth and Jeri on Luigi’s Flying Tires. Click photo for full size. Riding at Luigi’s Flying Tires. Click photo for full size. 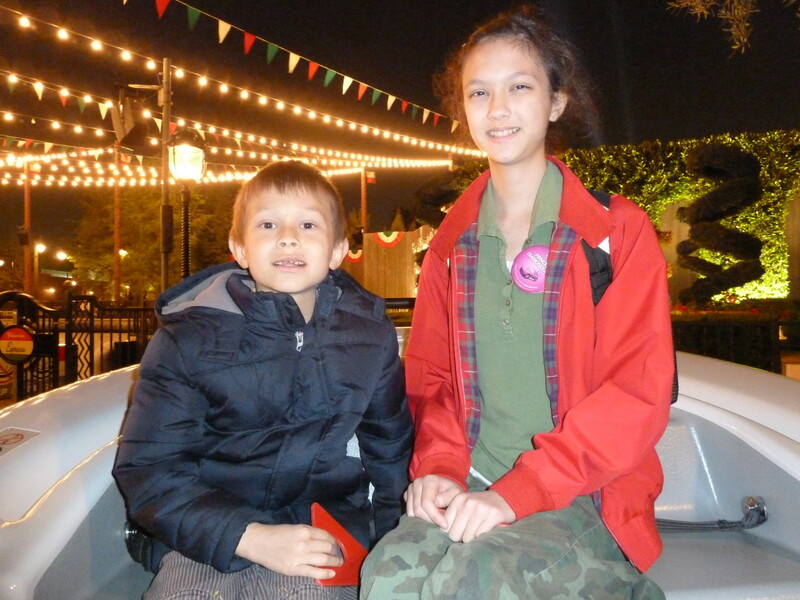 Josiah and Elizabeth on Luigi’s Flying Tires. Click photo for full size. We headed over to Disneyland to finish our day there. We found a good spot to watch the 9:30 PM fireworks show. 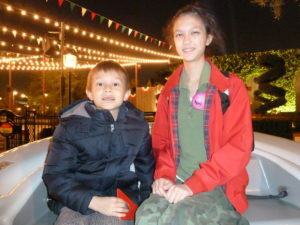 After the fireworks, we rode the Pirates of the Caribbean before watching the Fantasmic show at 10:30 PM. We had never seen the show before and were quite impressed. We walked out of the park around 11 PM, got home around midnight, and were in bed by 12:30 AM. 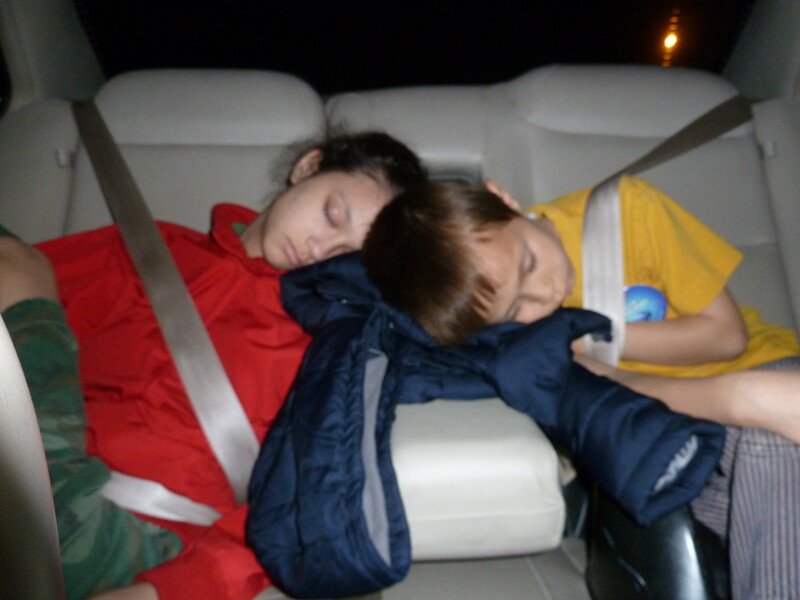 Elizabeth and Josiah after a day at Disneyland. Click photo for full size. Josiah woke up sick the next day. He had a slight fever and threw up several times. When we first purchased our passes, I honestly thought that, over the course of the year, we might grow tired of going to Disneyland. As a result, we didn’t go very frequently initially. But as the year progressed, our family has enjoyed Disneyland more and more. 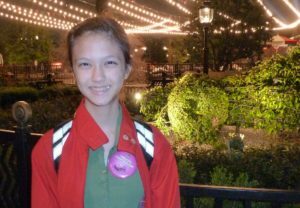 Because we bought passes for the rest of the family after ours, they can continue going through the month of May.